Jim Hearne, a retired certified public accountant, has spent many years and hundreds of hours on a variety of causes in Cheyenne, both through service-oriented clubs and others focused on economic development. He has participated in organizations including Cheyenne Frontier Days, the Greater Cheyenne Chamber of Commerce, the Cheyenne Rotary Club and the Cheyenne Lions Club. It came as no surprise to those in attendance at the Cheyenne Frontier Days Old West Museum that Hearne would be honored for service. Nonetheless, Hearne said he was “overwhelmed” by all the support. “I’m just overwhelmed with all the people who came to see me,” he said with a smile. In his speech, Hearne highlighted the role of Cheyenne Frontier Days in teaching him about volunteerism and community spirit. While working at his accounting firm, McGee, Hearne and Paiz, Hearne said he always encouraged employees to volunteer – not because they were told to, but because they were passionate about a cause and wanted to improve the community. He attributed much of his success to his wife, Peggy, and his business partners, family, friends and the community. “I believe that the community spirit is alive and well in Cheyenne, Wyoming, but we all need to continue to encourage involvement in community activities,” he said. Hearne’s speech was preceded by his accounting firm partners, Michl McGee and Joseph Paiz. Both men lauded Hearne’s commitment to service and dedication to his work. McGee remembered meeting Hearne when he moved to Cheyenne. He recounted years of work and Hearne’s contributions to the business. “It was a hell of a ride for the three of us,” McGee said. In the audience, family and longtime friends of Hearne celebrated his accomplishments. Hearne’s sister, Cheryl Bath, and her husband, Vince Bath, traveled from Laramie for the ceremony. Vince Bath marveled at how Hearne was able to help run the family cattle ranch, work at his accounting firm and volunteer at the same time. Other past recipients of the award were also in attendance. 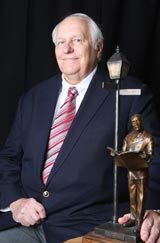 Bill Dubois, who was honored with the Community Spirit Award in 1999, said Hearne was completely deserving of the honor. Maurice “Maury” Brown, a lifelong philanthropist and business owner in Cheyenne, has been selected as the 2016 recipient of the Wyoming Tribune Eagle’s Community Spirit Award. Brown, 83, was born outside Sioux Falls, South Dakota, and spent his first few years in Iowa. His family moved to Cheyenne when he was 9, following his uncle, who started a grocery store here. Growing up, Brown worked selling newspapers, shining shoes and later at his family’s businesses. 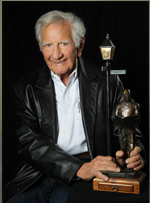 He graduated from Cheyenne High School in 1951. Brown said he told his mother he wasn’t going to college while his parents worked long hours at their store. I said, “Mom and Dad, I’m not going to school for three or four hours a day, four or five days a week, while you’re sitting here working 10 hours a day, seven days a week. I’m just not going to do it,” he said. “None of us can even comprehend the amount of charity that he’s provided to this community and this state because he’s not in it for the credit, and it’s even hard to find out how much he has done.” Governor Matt Mead said. But Brown doesn’t flaunt how much he’s donated, and it’s difficult to try to add it up. Some of Brown’s philanthropy includes: buying city licenses for children who want to sell snacks at Frontier Days; buying animals each year at the 4-H Livestock Sale and gifting them to local charities; buying thousands of dollars worth of bus tokens to provide to riders on the Cheyenne Transit city bus service; donating money to high school athletics programs; and donating to countless organizations. Brown cares deeply for Cheyenne and Wyoming, and credits the region for helping him be successful. Mona Pearl is a Cheyenne businesses woman who has dedicated herself to public service since arriving here. It’s hard to overstate the sheer breadth of Mona’s involvement since coming to Cheyenne in 1991. Presenting the award, WTE President and Publisher L. Michael McCraken described the multitude of organizations Pearl has lent her experience to through the years. Upon claiming her award, Pearl stressed the need to continue to support local nonprofits in the work they do, which she said is the true benchmark for progress in a community. “The way we get forward in the world is not because banks do the right thing, although they do, and not because we have businesses that keep moving forward and moving into Wyoming and Cheyenne,” Pearl said. “But it’s because we take care of our people, and that’s the work of our nonprofits, by and large. A Cheyenne attorney whose life-long passion for civic service was kindled by his early participation in the Boy Scouts has been selected as the 2014 Wyoming Tribune Eagle’s Community Spirit Award recipient. Dyekman said his membership in Boy Scout Troop 101 really laid the foundation for his commitment to community service. He joined the troop as a teenager, achieving the rank of Eagle Scout and was later involved with the Explorers. He has helped to raise money to support the Scouting program, and since 1998 has served on the board of trustees of the Longs Peak Council of the Boy Scouts of America. In 2006 he was the Distinguished Citizen honoree for the Cheyenne district. In recent years he has been very active with the University of Wyoming, particularly on the foundation, where he has served on the foundation board since 2003 and is a past chairman, and since 2012 has been an emeritus member. Dyekman was a founding member of UW’s College of Law Dean’s Advisory Board in 2002 and still serves on the board. Since 1997, he has served on UW’s College of Arts & Sciences Board of Visitors, and is a former chairman of the group. He has been an avid supporter and fundraiser for the Cheyenne Symphony Orchestra, and has served on its board and is a past president. Dyekman served as a loaned executive for United Way of Laramie County starting in 2003, was campaign co-chairman in 2009 and remains on its board of directors. He has also served on the Meals on Wheels foundation board, including two terms as president. He has been a member of the Cheyenne Kiwanis Club since 1981 and served as a board member for the club and its foundation. Dyekman also served on the Cheyenne Family YMCA board as president in 1992 and 1993. He also helped to raise funds for the Davis Hospice Center. Since 2005, Dyekman has served on the board of Cheyenne Newspapers Inc., and since 2012 he has also served on the board of directors for Cheyenne LEADS. Dyekman is an ordained Elder and Deacon of the First Presbyterian Church.He also serves as a volunteer consultant for governance and endowment issues for the Cheyenne Little Theatre board of directors, Cheyenne Animal Shelter Foundation, Meals on Wheels Foundation, Laramie County Library Foundation and United Way. He is long-time member of the Young Menâ€™s Literary Club of Cheyenne and was in the 2003 class of Leadership Wyoming. Starting his career as a law clerk in 1979 he is now a senior partner in Dray, Dyekman, Reed & Healey, P.C. Those who know Dyekman well are hard-pressed to remember him ever saying a bad word about anyone else, or to complain about anything. Marientta Trowbridge Dinneen whose love of history helped create one of the country’s largest and best-preserved collections of horse-drawn carriages is the recipient of the 2013 of the Wyoming Tribune Eagle’s Community Spirit Award. Dinneen was a newlywed and a University of Wyoming graduate with a home economics degree when she moved to Cheyenne in 1951 with her husband, the late William J. Dinneen, Jr.
Marietta’s love of Western history played a pivotal role in the development of the Old West Museum and its nationally recognized carriage and wagon collection. Dinneen, who taught home economics classes at Carey Junior High in the 1960s and 1970s, was invited to join the W-Heels organization in 1966. The group of women volunteers assists with the Cheyenne Frontier Days celebration by staging the historic vehicle portion of the downtown parades. Dinneen said when she joined the W-Heels, many of the 67 carriages in the collection at that time were heavily weathered and run down. The best of the lot would only receive enough repair and maintenance to make them parade-worthy. As part of the Carriage Coordinating Committee, Dinneen and her fellow volunteers knew where some of the carriages had come from and through interviews and research they began documenting the history of the carriages. In 1971, Dinneen’s husband, William, who was parade committee chairman, and the late Sharon Farthing Tuck, W-Heels president, created a group of volunteers called the Wagon Doctors to restore and maintain the collection. As their knowledge and expertise grew, the volunteers were able to restore selected vehicles to excellent condition. In 1977, the volunteers received a major shot in the arm with the donation of 16 rare carriages from a collection which had been owned by the late Lawrence C. Phipps of Denver. In the spring of 1978, CFD officials said they wanted a place to house the two growing collections, owned by CFD and the museum. 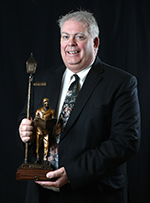 Dinneen became one of the founding members of the board of directors for the museum. Dinneen was also involved in the Carriage Association of America and the National Stagecoach and Freight Wagon Association. The museum and CFD now have 160 vehicles in their jointly managed collection, 59 of which are regularly used in the annual parades. Dinneen said she has three favorites: the Cheyenne-Deadwood Stagecoach, used in the Charlie Irwin Wild West Show around the turn of the century and which represented Wyoming in the 1976 Bicentennial parade in Philadelphia; an ambulance used by St. John’s, Cheyenne’s first hospital, and the Carey mail wagon, brought here by Joseph M. Carey and one of only four known to exist. When Dinneen was president of the board in 1989, the museum received a major financial donation, the gift allowed for a large expansion of the exhibit space. In addition to the museum, in past years Dinneen served on the DePaul Hospital Guild and was on the Laramie County Community College Foundation board when the college successfully sought a bond issue for its first dormitory. In 1989, she was named woman of the year by the Greater Cheyenne Chamber of Commerce. Since 1954 she has also been involved in community improvement projects through Women’s Civic League, and is a past president of that organization. But it is obvious that she holds a special place in her heart for the museum and its carriage collection. That history will be passed on to future generations, including her own family. Dinneen has two sons and daughters-in-law, Jim and Ray and John and Eileen, five grandchildren and one great grandchild. Longtime local businessman who spearheaded an effort to fly veterans to Washington, D.C., to see the World War II memorial honoring their service is this year’s recipient of the Wyoming Tribune Eagle’s Community Spirit Award. For the past five years, Fleischli served as chairman of Honor Flight, which took more than 650 Wyoming veterans on a two-day trip to the nation’s capital. Every Wyoming veteran who was able to travel and wanted to go was sent on one of six chartered flights from Casper or Cheyenne. â€œIt was the most rewarding endeavor that I ever took on,â€ Fleischli said. Fleischli graduated from Cheyenne High School in 1943 and attended the University of Wyoming until World War II intervened. Fleischli joined the Army Air Corps at age 17 and flew 32 missions over Germany as a waist gunner in B-17 bombers until the war ended. Returning to UW and later Cheyenne, he worked in his family’s Studebaker car business until 1955, when he formed a partnership that leased the land and building and operated a Husky Truck Stop in west Cheyenne. It grew to three truck stops along Interstate 80. He had also started Fleischli Oil Company. Fleischli has a long history of involvement in other civic endeavors, especially Cheyenne Frontier Days. He worked odd jobs on the grounds and helped with security and in 1958 was elected to HEELS, the volunteer organization for CFD. Fleischli also served as Grounds Committee chairman, and in 1966 and 1967, he was general chairman. He expanded the night show, where the main attraction was chuck wagon races, to include other entertainment. For more than 20 years after his chairmanship, he rode in the arena picking up flank straps from the bucking horses. Fleischli now helps move the parade horses downtown from the Frontier Park and back. Fleischli is a former board member for the CFD Old West Museum and served on its development committee. He is a member and past president of the Cheyenne Quarterback Club and Cowboy Joe Club. Fleischli was involved with the Cheyenne LEADS Progress and Prosperity effort to raise money to provide improvements to local business parkways. He has also been involved with the Greater Cheyenne Chamber of Commerce and raising money for the new Riske Field. 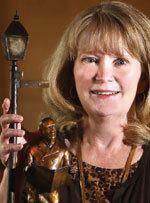 Fleischli has served on the Cheyenne Regional Medical Center Foundation board for the past 10 years. Since 1978, he has served on the University of Wyoming Business School Advisory Board, which helps the school recruit students and find jobs for graduates. He was appointed by Gov. Dave Freudenthal to the Wyoming Business Council, where he served from 2005 to 2011. Fleischli also served on the Wyoming Highway Commission for six years, including chairman in 1970 and 1971. He was president of the U.S. Highway 30 Travel Association, which raised money to advertise in the Chicago and Kansas City markets to promote car travel through Cheyenne. He served in the Wyoming House of Representatives, and in 1977, during his third term, resigned to run, unsuccessfully, for governor. Besides Honor Flight, Fleischli said one of his most memorable experiences was receiving an honorary doctor of law diploma from UW in 2011. Cheyenne Attorney James L. Applegate has devoted more than 50 years of his life volunteering in many areas of the community, but those who know him well say he has never once sough praise for himself. 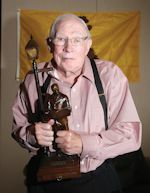 Applegate graduated from Torrington High School in 1949, received a Bachelor of Arts degree with a major in political science from the University of Notre Dame in 1953 and graduated from the University of Wyoming’s College of Law in 1958. While at Notre Dame, Applegate served in the U.S. Marine Corps reserves. He was later commissioned as a first lieutenant and served in active duty from 1953-55. He was Cheyenne’s assistant city attorney from 1959-62 and subsequently became involved in numerous local civic organizations. 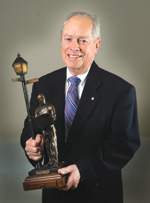 Applegate has been a member of the Rotary Club of Cheyenne since 1968 and served as president in 1981 and 1982. He was on the State Board of Law Examiners from 1979-88 and served as president from 1983-88. Applegate served on the Cheyenne Board of Public Utilities from 1979-91, and was president from 1984-91. He served as a board member for the Wyoming Community Development Authority from 1988-96 and is a past member of the Cheyenne Urban Renewal Advisory Committee, which sought federal funds to redevelop blighted commercial areas of the city. Applegate is especially proud with his volunteer service as a trustee for St. Joseph’s Children’s Home in Torrington. He has a special affinity for the residential youth treatment center, since he grew up in Torrington and had friends and fellow Boy Scout troop members who lived at what was then St. Joseph’s Orphanage. Applegate attained the rank of Eagle Scout. He served for 12 years on the Wyoming Retirement System Board and was chairman from 2005-06 and served as Senate minority floor leader in 1995-96 and also was on several legislative committees. He also served on the board for the Wyoming Transportation Museum Corporation for the building. Applegate also has been very active in Cheyenne Frontier Days Contestants Committee for 33 years and was inducted into the CFD Heels in 1970. 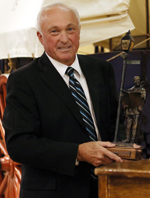 He also was involved with the Greater Cheyenne Chamber of Commerce was named the chamber’s Person of the Year in 1988. Applegate was a director for the Cheyenne Symphony Foundation from 1992-2006. He also has served on the boards of Cheyenne LEADS and the CFD Old West Museum, among other organizations. Applegate has enjoyed being a driver for Meals on Wheels since 2008. He has belonged to the Young Men’s Literary Club since 1989 and has served as a trustee for St. Mary’s Cathedral from 1969-2003 and has been active in the Catholic Church in many capacities. Frances M. Smyth’s work with the local Habitat for Humanity, now completing its 29th and 30th houses this summer, is emblematic of the “can do” attitude of the Community Spirit Award recipient for 2010. In 1994, Fran joined the board of directors for Habitat for Humanity of Laramie County. The local affiliate was struggling to raise $1,000 to purchase cookbooks that would be sold to build a Habitat house. “If you’re going to build a whole house, you need to kick this into high gear,” Smyth remembers telling her fellow board members. She knew what she was talking about: as a teenager growing up in Huntington, Long Island, N.Y., her father — who was a firefighter, but had a contracting business on the side — taught his three daughters every aspect of the home construction trade. Now in her 12th year as president of the local Habitat board, Smyth has raised donations, written grants, established business partnerships and recruited volunteers, all with the goal of building affordable houses for low-income people. Thanks to her extensive construction experience, she also can frame a house, hang drywall, install cabinetry and tackle just about any other job necessary to erect a home. “I just think it’s really important to lead by example,” said Smyth, who donates an average of 30 hours a week to Habitat, working at the job sites as well as handling the organization’s accounting. From a bare-bones organization that was struggling to raise money to build its first house, Habitat has grown to an organization with $1 million in funds, property and mortgage loans. This summer, Habitat is completing its 29th and 30th houses. Next year will mark the organization’s 20th anniversary, and its first homebuyer mortgage will be paid off. Last November, under Smyth’s guidance, Habitat opened ReStore, a business that sells unused building supplies, appliances and furniture donated by contractors, individuals and home improvement stores. The new store keeps unused construction materials out of the city landfill, and many of the donated furnishings are new and in excellent condition, with only minor damage or blemishes. Sale proceeds help build more houses. Smyth also was instrumental in forming a local chapter of the national Habitat for Humanity Women Build program and Youth Blitz Build another program started about two years ago in which college students volunteer to help nonprofit organizations. “When you go home every day to your nice, warm, comfortable house, knowing that other people have that, too, makes you feel a little better about yourself,” says Smyth. Since coming to Cheyenne, Smyth also has been a kitchen volunteer, past board member and delivered meals for Meals on Wheels. 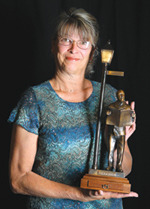 In past years, Smyth also served on the Old West Museum board of directors, chaired the Western Spirit Art Show in 1998 and helped the museum develop a computerized archive of its collections. She also is a member of Women’s Civic League and has served on its board in a variety of positions. Smyth and her husband, Dennis, also have served for many years on the Cheyenne Frontier Days Ticket Committee. Michl T. McGee, who played a key role in laying the foundation for Laramie County’s highly-successful economic development program, is this year’s Community Spirit recipient. After moving to Cheyenne 26 years ago, McGee, a certified public accountant, became one of the founders and the first chairman of IDAC’s successor, Cheyenne LEADS. His involvement was instrumental in many ventures, in-cluding Progress and Prosperity II. In the 1980s, McGee served for eight years on the board of STRIDE Learning Center, a developmental preschool. His time on the board included six years as president. McGee also served on the Laramie County School District 1 Board of Trustees for six years, including a term as chairman. He served on the Untied Way of Laramie County board for five years, including three as president, and is a past-president of the Laramie County Library Foundation board. McGee has been a member of Cheyenne Rotary Club since 1968, and is still active in the local club. He served on the club’s board for 10 years, including stints as treasurer and president. McGee is also a 21-year member of the Cheyenne Young Men’s Literary Club. For the past year, McGee has served as president of Honor Flight, an organization that raises money and organizes trips to Washington D.C. for Wyoming veterans. On these sponsored trips, veterans visit the World War II Memo-rial and several other war memorials and national monuments. Under McGee’s leadership, McGee, Hearne & Piaz has donated accounting work for various charitable and non-profit organizations. The firm also has been a donor to and supporter of many local organizations, including Chey-enne Frontier Days and youth sports activities. McGee’s many years of civic service are even more remarkable considering that he and his wife, Ellen, have raised 14 children, including 11 who were disadvantaged. The children now range in age from 25-45. Shirley Flynn’s involvement in the Old West museum and Cheyenne is legendary. 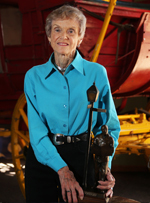 Shirley was a member and secretary of the Old West Museum’s founding board of directors. She was also an intragel part of the group that established the museum’s major fundraiser, the Frontier Days Art Show. 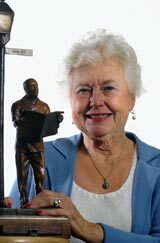 Shirley served as the museum’s director during that time the museum received donations to build the Vandewark Wing. She was a member of the building committee for the project, which was completed in 1992. Shirley is the author of several books on local history including one about the history of St. Mark’s Episcopal Church, where she served as a member of the altar guild for 40 years. She is a past member of the Wyoming State Museum’s volunteer group and continues to write articles for “Annals of Wyoming,” a history magazine. She continues to give speeches and presentations of historical significance to local school children, civic groups, clubs and historical societies. Shirley is also a member of Women’s Civic League, P.E.O., the CFD Buckle Club, the W-Heels, Cowgirls of the West and the city’s Historic Preservation Board. In past years Shirley also served on the production board of the Cheyenne Little Theater and on the Laramie County Memorial Hospital Foundation Board.